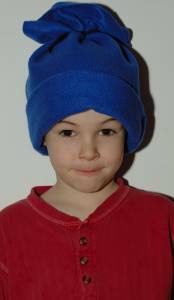 A Fleece hat , a fun and easy kids sewing project. 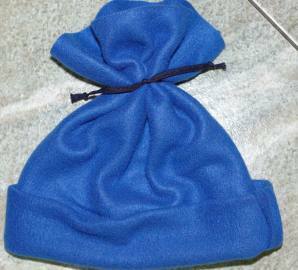 wearing the finished hat) and add 2 inches to the number. This will be the length of your hat. 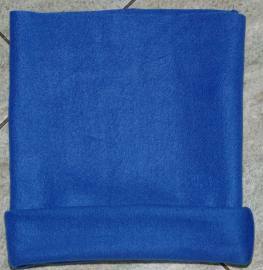 Lay out your fleece material and cut a rectangle 16 inches x the length determined. Use a fabric marker or pencil and a quilting ruler to draw the measurements and then cut. Fold material in half with right sides together. Sew along the side leaving the top and bottom open. Turn right side out. Fold bottom edge up several times. Gather the top of the hat together and tie your cord or ribbon. If you'd like to fringe the top of your hat do so with scissors after you have tied it. The cuff or rolled edges of your hat may come unrolled easily. 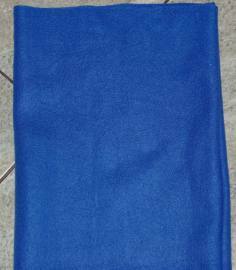 If you would like you can hand sew a few stitches on the sides or add a button for decoration to the side stitch. 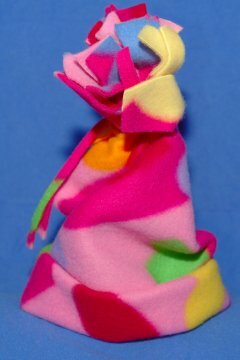 Take me to Level 2 Pre Beginner lessons from Fleece Hat.